1. Place the cod and Keralan curry paste in a bowl and mix to coat evenly. Set aside. 2. Cook the sweet potato in boiling water for 8-10 minutes until tender, drain and cool. Place in a food processor with the cod and any excess curry paste, the coriander and flour. Season and blend to give a coarse texture. 3. With damp hands, mould the mixture into 12 fish cakes. Heat the oil in a non-stick frying pan and fry the fish cakes in 2-3 batches for 3-4 minutes each side until golden and cooked through. 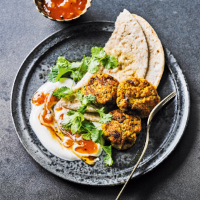 Serve on top of the warmed chapatis with a spoonful of yogurt and mango chutney, garnished with coriander.